Supermicro is a global leader in high performance, high efficiency server technology and innovation. We develop and provide end-to-end green computing solutions to the data center, cloud computing, enterprise IT, big data, high performance computing, or HPC, and embedded markets. Our solutions range from complete server, storage, blade and workstations to full racks, networking devices, server management software and technology support and services. We offer our customers a high degree of flexibility and customization by providing what we believe to be the industry’s broadest array of server configurations from which they can choose the optimal solution which fits their computing needs. 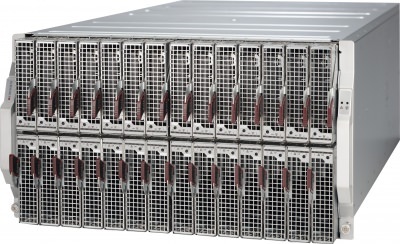 Our server systems, subsystems and accessories are architecturally designed to provide high levels of reliability, quality and scalability, thereby enabling our customers benefits in the areas of compute performance, density, thermal management and power efficiency to lower their overall total cost of ownership. We perform the majority of our research and development efforts in-house, which increases the communication and collaboration between design teams, streamlines the development process and reduces time-to-market. We have developed a set of design principles which allow us to aggregate individual industry standard components and materials to develop proprietary products, such as serverboards, chassis, power supplies, networking and storage devices. This building block approach allows us to provide a broad range of SKUs, and enables us to build and deliver application-optimized solutions based upon customers’ requirements. We conduct our operations principally from our headquarters in California and subsidiaries in Taiwan and the Netherlands. We sell our server systems and server subsystems and accessories through a combination of distributors, including value added resellers and system integrators, and to a lesser extent to OEMs as well as through our direct sales force. During fiscal year 2015, our products were purchased by over 900 customers in 100 countries. Supermicro commenced operations in 1993 and have been profitable every year since inception. The FatTwin™ is the latest addition to Supermicro’s evolving line of Twin Architecture SuperServer® solutions. 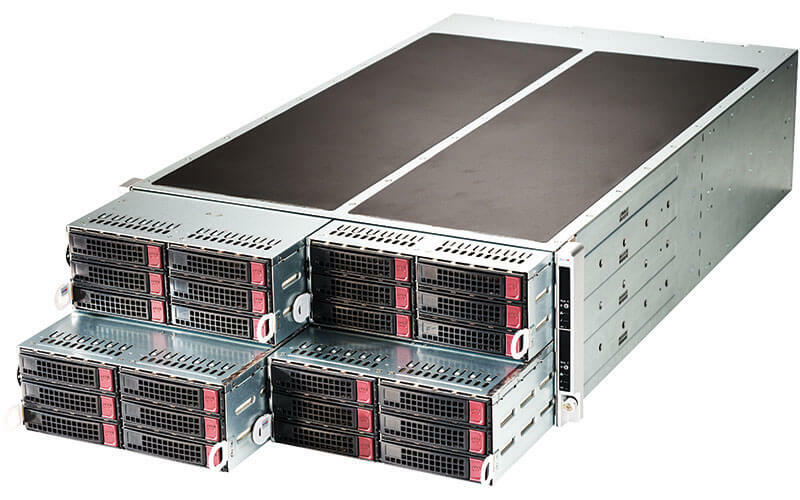 The 4U FatTwin greatly expands compute and storage capacities beyond Supermicro’s existing 2U Twin2™ and 1U Twin™ SuperServer® systems to achieve increased performance with lower power consumption. By virtue of its shared components the FatTwin improves cost-effectiveness and reliability, while its modular architecture makes it flexible to configure and easy to maintain. nments up to 47°C, providing considerable cost savings and improved TCO. Versatile configurations allow the FatTwin to be optimized for many different environments including Data Center, Cloud Computing, and HPC; Engineering, Research, and GPU/Xeon Phi projects; File and Storage Server deployments; and General Server and Enterprise Server applications. 2.5″ SATA HDDs (12-Node model). s for a Green energy profile. The Nodes provide easy access for efficient servicing, and the high density per node saves valuable data center space. The Supermicro MicroCloud systems are optimized for cloud computing, data centers, web hosting, and virtualization environments. 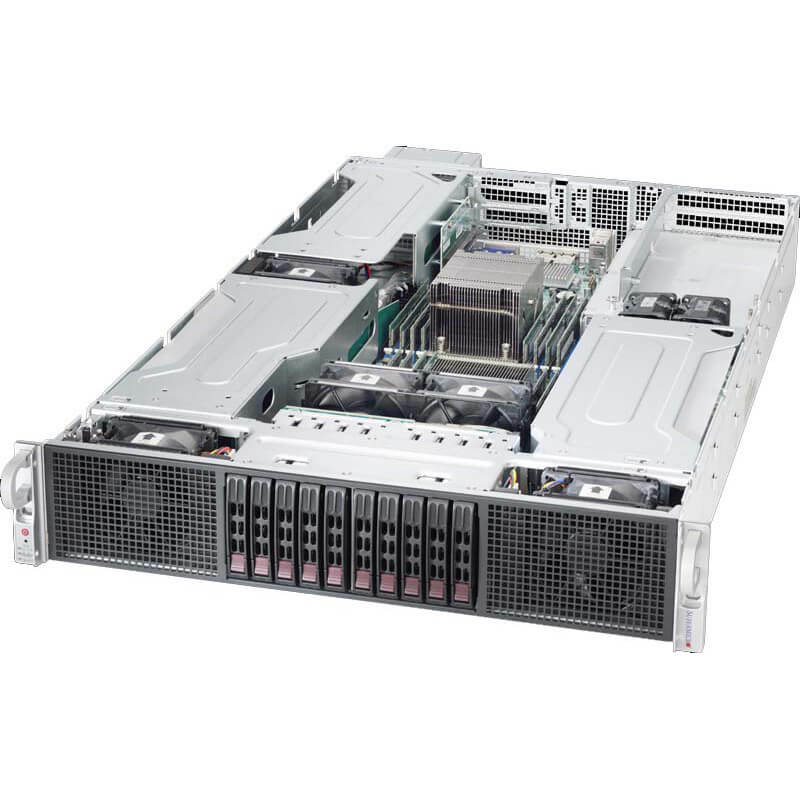 Supermicro® supports Intel® Xeon Phi™ Coprocessors and NVIDIA GPUs across a wide range of high-performance server and workstation product lines. Supermicro’s computing platforms achieve higher parallel processing capability with Intel’s MIC (Many Integrated Core) architecture based Xeon Phi™ Coprocessor and NVIDIA’s newest Tesla Kepler GPU workhorse. Unified with the latest Intel Xeon processors utilizing common instruction sets and Xeon Phi’s multiple programming models, it is easier to port parallel computing applications in the hybrid environment and take advantage of the powerful processing resources of Supermicro’s HPC platforms. With NVIDIA Tesla Kepler users can effectively utilize SMX- the most programmable, powerful, and energy efficient Streaming Multiprocessor- with Dynamic Parallelism and Hyper-Q technologies to rapidly and dynamically allocate, balance and optimize workloads. Engineering, scientific and research fields can dramatically accelerate application performance with minimal investment in development with Supermicro’s Intel Xeon Phi™ and NVIDIA GPU based supercomputing solutions. e the highest performance and efficiency with exceptional value. Supermicro delivers the industry’s fastest, most powerful server solutions with compute speed and reliability as the primary focus, targeting mission critical applications. Built upon the X9DAX series motherboard, Supermicro is able to enhance the highest performance Intel® Xeon® E5-2600 series processors (up to 150W TDP) with Hyper-Speed, achieving application performance improvements up to 30%. Supermicro’s Hyper-Speed Solutions are available in Tower, 4U and 2U rackmount configurations. Applications that benefit from the high-speed processing power of these solutions include HFT, Computational Finance, EDA, HPC, Scientific and Energy Research. ost advanced features into a family of 1U and 2U rackmount systems. Powered by redundant 920-watt Platinum Level power supplies with optimized thermals, the 2U resource-optimized servers can support sixteen 2.5″ or eight 3.5″ SATA or SAS 2.0 (6 Gb/s SAS) hard drives with onboard hardware RAID 5. They also feature dual 10GbE ports, 18 DDR3 memory slots, quad 1GbE LAN ports, and onboard IPMI 2.0 with media and KVM-over-LAN support, and up to six expansion cards (four full-size and two low-profile). Supermicro offers 1U versions of these servers with 700-watt Gold Level power supplies that support eight 2.5″ or four 3.5″ hot-swap hard drives and up to three expansion cards (two full-size and one low-profile). Supermicro’s new, innovative Battery Backup Power (BBP®) technology provides a cost-effective infrastructure solution for mission-critical server and storage operation. 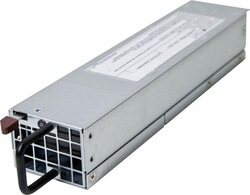 The PWS-1K03B-1R is an industry-first Battery Backup Power (BBP®) module contained in the same form factor as a Supermicro redundant AC power supply (76W x 360D x 40.4H mm). This module is hot-swappable and fits Supermicro 1U/2U/3U/4U chassis providing high output power in 1200W/1min and 1000W/2.5 min options. These can be implemented in 1+1+1 (2 AC modules + 1 BBP Module), 1+2 (1 AC + 2 BBP @ 2000W) or 2+2 (2 AC + 2 BBP @ 2000W) configurations. For Supermicro’s 1U servers, the PWS-206B-1R (54.5W x 220D x 40H mm) provides BBP® protection in 200W/5min and 100W/15min options. Supermicro’s all-star mainstream lineup of serverboards and servers includes models for every need. Performance enhancements over previous generations of systems for these Xeon Processor E5 series based DP Twin servers and serverboards include up to 8 cores per CPU / 16 threads, extra memory capacity with four channels per CPU for up to 768GB of Reg. ECC DDR3-1600MHz memory, and two QPI links running at up to 8 GT/s each. Extra enhancements include the option of either SATA 3.0 or SAS 2.0 (6Gbps) HDDs, Quad GbE LAN, PCI-E 3.0, 2.5″ or 3.5″ HDDs, upgraded fans with highly effective cooling architecture, and redundant Platinum Level power supplies. With Supermicro’s signature quality and support, customers will benefit from more processing capacity in less space with better efficiency and cost profiles. Based on the Intel® Xeon® Processor E5-2600 series, these UP and DP Mainstream servers are the best choices for Enterprise , Hosting and Data Center applications. Vianet is certified to provide support and maintenance on Supermicro products. For more information on Supermicro products, please contact Vianet on +356 27221629 or by email on info@vianet.com.mt.